The Home Run Baseball Toss float is a great way to have tons of fun and loads of laughter. The Baseball Toss game is an enjoyable game of tossing skill in which baseball plays are determined by the accuracy of your tosses onto the moving floating baseball diamond. 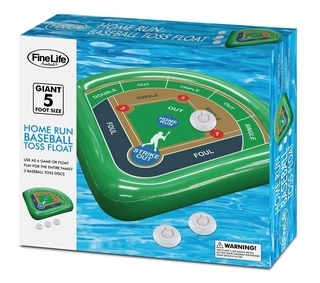 Stick to the rules of Baseball or make up your own games, this fantastically enjoyable pool toy is sure to make a splash. If your not feeling the toss game the Home Run Baseball pool float is also a pool flotation device ready to rock for family jumbo float fun. The Baseball float measures a whopping 5 feet across and comes with 3 baseball toss discs as well as a two piece patch kit.